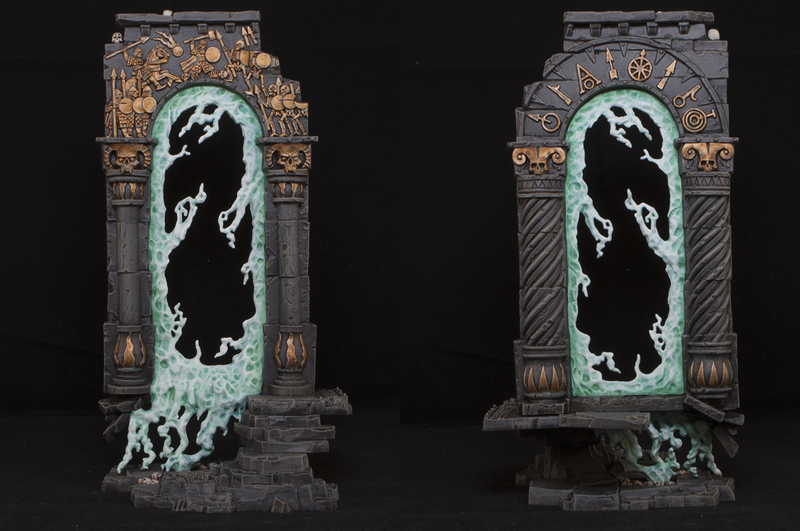 As my first piece of Age of Sigmar scenery the Realmgate was a ton of fun to paint, it was really quick too. While I was working on my second one I put together a step by step tutorial which I have here along with the finished pictures! These were super quick to put together. There are no sprues and all you had to do was glue the five separate parts together and do a little bit of mold line removing. It's quite different from what you're use to from GW scenery and is packaged very nicely too. It's a great piece of scenery and I hope to see more of it from GW in the future. 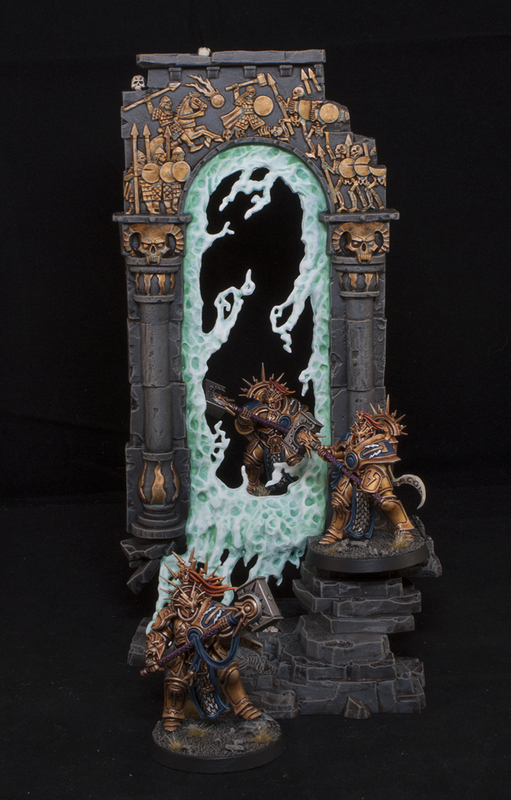 So this is not the greatest start to a tutorial, but I unfortunately didn't get any pictures of the stone in progress. All I did though was base coat it the Mechanicum Standard Grey with an airbrush. I then used some Adminstratum Grey to give a quick zenithil highlight. All of this was than given a wash of Agrax Earthshade. I then went back and picked out a few random stones with other washes like Reikland Fleshshade and Athonian Camoshade. This just breaks up the color a bit and gives it a more natural and realistic look. The whole thing then got a drybrush of Mechanicum Standard Grey and then finally a light drybrush of Karak Stone. I picked out all of the gold areas with Retributor Armor. You can pick out which ever areas you want, there's not really a part that needs to be gold, in fact I picked out a few different areas on my two gates to make them unique. All of the gold then got a wash of Reikland Fleshshade. The relief and skulls got a drybrush of Liberator Gold for a highlight while the flatter areas got some quick line highlights of the same color. The last thing I did was pick out a few select recesses with Nihillakh Oxide to make it look weathered. You don't want to go overboard, so just paint it exactly where you want it instead of as an all over wash.
All of the skulls were base coated with a solid coat of Screaming Skull. This takes a few layers but not many since the skulls are so small. All of the bone areas then got a wash of Agrax Earthshade. I then went back and layered on some Screaming Skull making sure to leave the wash showing in the recesses. Lastly they got a final line highlight of White just picking out the most important details. The entire portal got a solid base coat of Ceramite White. Be careful when you are painting this on not to accidentally flick specks of white on to the surrounding stone. I did this a bit on my second gate and had to go back and fix it up. 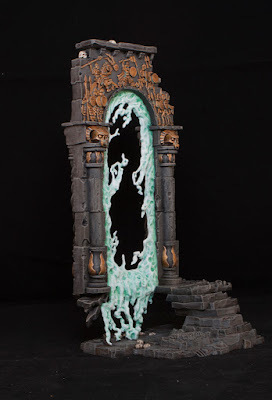 This takes about 3 - 4 coats of white to get a nice solid color, but the portal is so big that by the time you finish the back the front will most likely be dry. 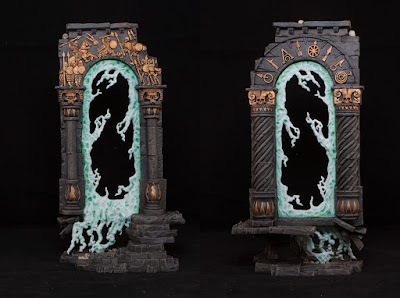 I then washed the whole portal with a mix of Nihilakh Oxide and Lahmian Medium. You want this to be really diluted so I would say it was about a 50/50 mix if not more heavy on the Lahmian Medium side of things. I then made a mix of Biel-ten Green and Nihilakh Oxide with a bit of Lahmian Medium to darken the edges of the portal closest to the stone. You want to try and blend this in a bit to the center of the portal but it doesn't have to be super perfect because the next step will hide it a bit. The last step is to relayer on white, not Ceramite White though, that's to opaque. Start at the center of the portal and work outwards to the edges near the stone following the raised edges of the ripples in the portal. You want to leave the greenish color in the folds of the portal and make the white the strongest right near the center. This may take a few layers to build up the transition, but it shouldn't be too hard since white is pretty translucent. 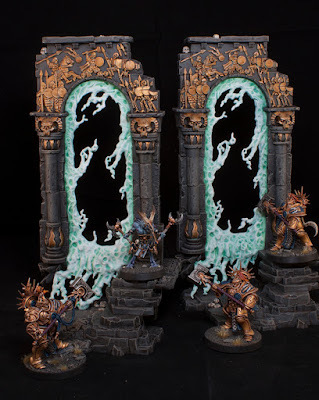 That's it, your portal is done! I hope this was helpful, so get your Realmgates on the table and start fighting over them, this is the Realmgate Wars after all.